Fall has arrived in Chittenden County! 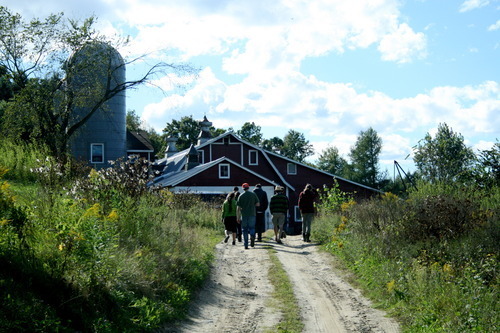 September 5th brought us the first taste of autumn, and another farm trip day for Healthy Living staff. These opportunities to see how and where our products are being grown bring us that much closer to our amazing farmers, and at Healthy Living we work hard to bring that experience directly to you! Though the busy season for Vermont farms has peaked and preparations for colder months are underway, there was still plenty in the ground for us to feast our eyes on…as well as plenty of tasty winter delights that haven’t yet hit shelves (think colorful squashes, hearty roots and pastured meats!). Our first stop on this cool but sunny morning was at Bread and Butter Farm right next door in Shelburne. 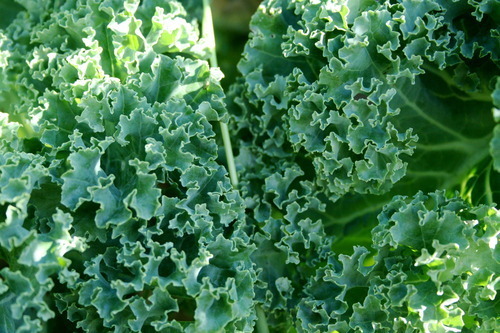 At the store, we know Bread and Butter best for their hearty seeded breads, their grass-fed beef, and their curly green kale. When we arrived, farmer Corie and 4 farmers-in-training from UVM were in one of their hoophouses harvesting kale destined for our own shelves. Coincidence? We would see this happen again later in the day…so I think not! Corie took us down to see their mixed herd of dairy and beef cows, who are grazed rotationally and constantly on the move. On our walk, she explained that their rich, claylike soil is best suited for growing grass. 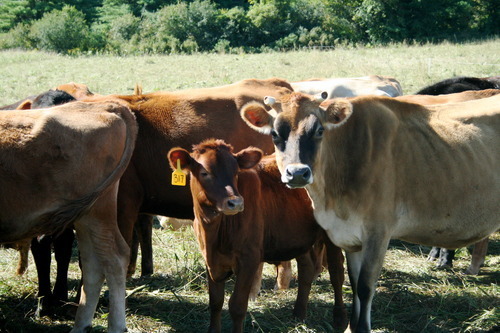 Lush, diverse, and perfect for grazing, this green gold is their bread and butter! Corie and Adam, her business partner are passionate about dairy and sell their raw milk in their farm store. The beef cattle are available there too, as well as in our own Meat Department, and ground up into burgers every Friday night. The Bread & Butter trilogy of meat, bread and veggies is featured all summer long at their Burger Night. 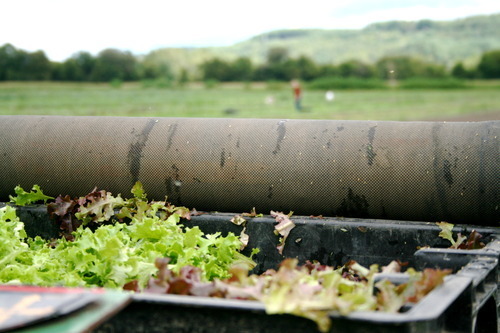 Being able to serve up patties, buns and salads on the ground from which they came could only happen on a small-scale, diversified farm like those which we support. Our final stop of the tour was in the bakery, where Adam was mixing dough for a weekly bread bake. All the flour used is milled freshly on-site, and their several varieties of bread are a year-round staple. What I like most about Bread and Butter is their emphasis on farm diversity and community involvement, and their clear intentions to stay small and develop what they are obviously excelling in. 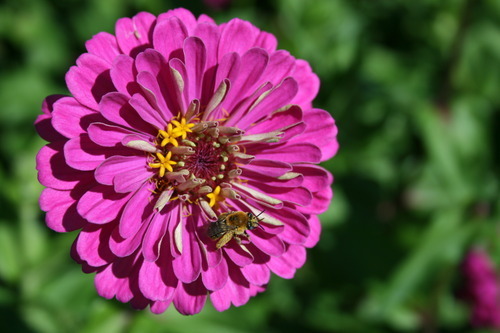 Whole-systems thinking is in action on this innovative farm! It was hard to imagine greener pastures, but we had other stops to make. With Cheesefactory Road in the rearview, we headed for Jericho Settlers’ Farm in Richmond, one of two sets of fields that they work (the primary farm is, of course, in Jericho). 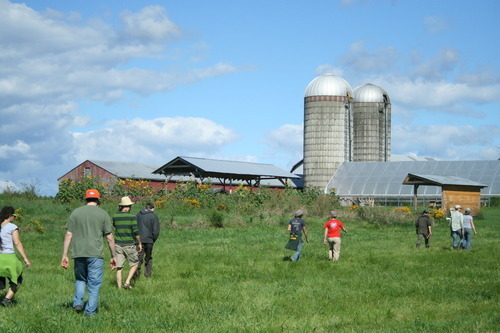 Though the largest of the farms we visited, it’s still family owned, and operates on the two oldest farmsteads in Jericho. Roots run deep for these hardworking folks. When we arrived, farmer Christa politely asked us to move our cars—we were blocking the way for pigs to be moved! In addition to a huge diversity of vegetables, JSF raises pastured pork and lamb, as well as beef cattle which graze at their other location, and a large flock of chickens who lay their famous solar eggs for us at Healthy Living. 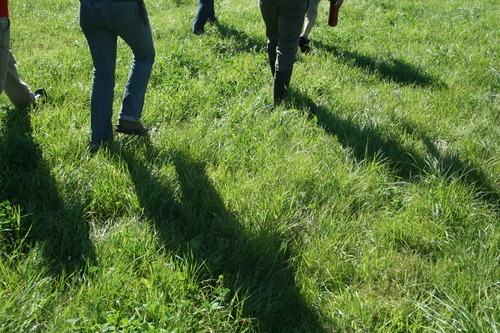 Christa walked us through their fields in the floodplain of the Winooski, where they had a very wet start to the summer. Despite the mud, they’ve more than managed to supply us a rainbow of produce, with tender lettuces, colorful chard, and delectable squashes, to name a few. We saw what seemed like endless rows of carrots still in the ground, which they’ll store throughout the winter, and a dense, shimmering cabbage patch. Much to look forward to from these folks in the coming months! Christa fired up a mechanical greens harvester to show us how our mesculun mix is brought in, which was the neatest piece of farm machinery this city girl has ever seen! Next she showed off their seeder, which adjusts to minutely control the spacing between seedlings. 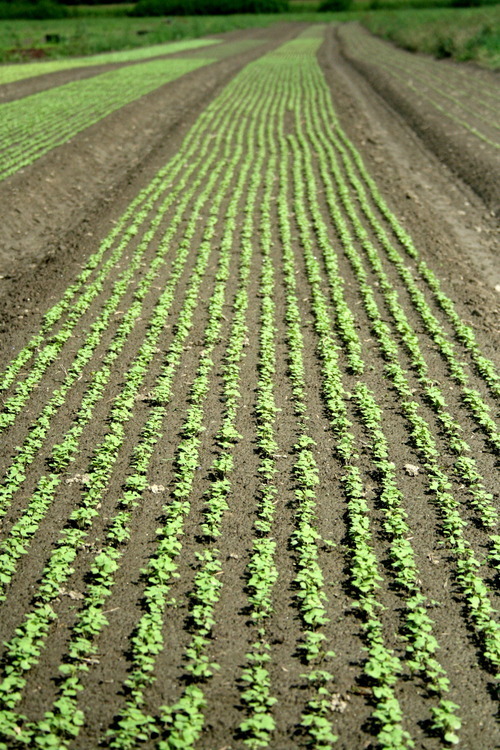 By fine-tuning the seeding process, they achieve perfectly spaced rows, eliminating the need to return and thin seedlings, saving time, effort, and of course, seeds. Impressive is the word I would use to describe JSF, a farm that is clearly meeting and exceeding its potential, running an efficient operation and maintaining a strong presence in the Burlington local food landscape. Christa had lost count of their hoophouses at the Jericho farm—was it the 8th, or 9th currently under construction? They show no signs of stopping what they’re doing, and we love it! After a brief siesta at On The Rise Bakery, we continued down the road to Burnt Rock Farm in Huntington, nestled in a vale alongside the Huntington River. This fertile glacial soil is farmed by Justin and his wife Lindsay, from whom we’ve already received beautiful burnished eggplants this summer. The lion’s share of their harvest is yet to come, however. 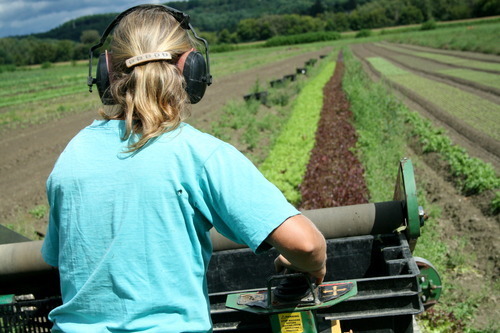 With only 7 acres, these wise folks have taken a more specialized approach to farming. They pump out greens all summer long—baby spinach was thriving in the moist soil and still being planted when we visited—and the rest of their harvest is winter storage crops, to be cured and sold throughout the winter. Their specialty is potatoes (especially the sweet ones!) 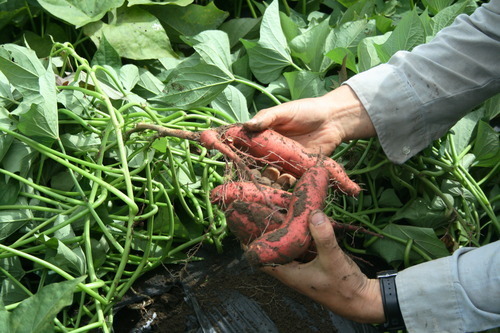 and they also grow winter squashes, garlic and onions. Justin took us out to see the sweets, which were nestled under layers of black plastic, practically invisible beneath their spreading shoots. 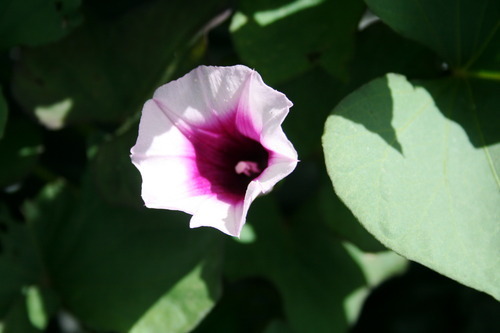 I had never seen sweet potatoes in the ground before, and was stunned by the beauty of their pale pink flowers and dark rusty leaves. He punched through the plastic to pull up a bunch of glowing tubers, which were already hefty and with plenty of room to grow. Look forward to seeing these gems in the coming months! We ended up in the storage house, where Justin’s assistants were boxing up an order of delicata squash destined for none other than Healthy Living! Their several varieties of squash were quickly filling up the storage space, and with more still to come, Burnt Rock clearly has strategized for a bounteous fall and winter. The industrious Justin also showed us a round of red chard that had just gone into the ground in his hoophouse, to be ready in late November when other farms’ greens were dwindling. Pretty clever—but this all made sense when we saw where he learned his tricks. Before buying his own farm, Justin was a farmhand at none other than Full Moon Farm. 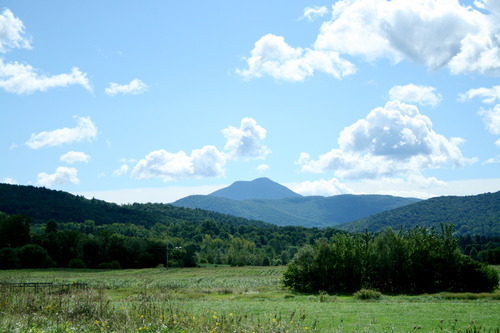 Having one more stop to make, we said goodbye to Justin and drove through Hinesburg Hollow to the Zuckerman’s sprawling farm on the other side of the mountains in Hinesburg. Full Moon got its start in the Intervale, but has moved on to new horizons and an expansive swath (155 acres, to be exact) of well-drained, scenic farmland. Dave is a busy man these days with a senate seat, not to mention a farmstead, to hold down, and unfortunately our little visit went under his radar. Though we didn’t get to talk to Dave, we got an excellent tour from Rachel, his witty and incredibly down-to-earth wife. 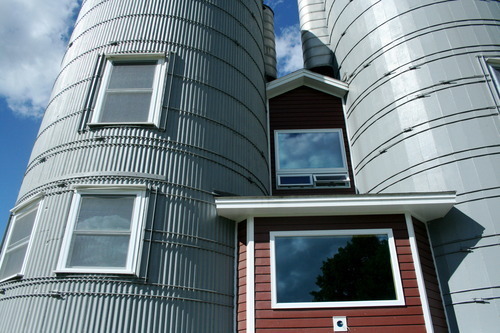 She brought us through the silo-flanked barn, which, by amazing feats of architecture and what sounds like plenty of hair-tearing, is also their dwelling space. They had just completed a chicken slaughter in their certified facility, and though we won’t see their birds at the store, their 300 CSA members will! 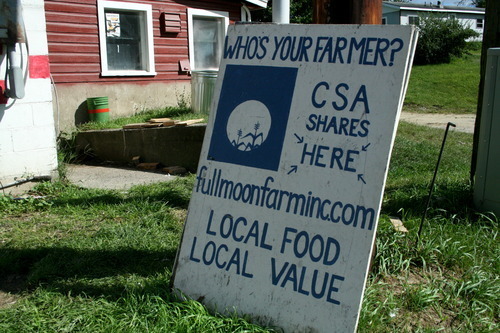 Full Moon is primarily focused on their shareholders and the Burlington Farmers’ Market, and after seeing how much bounty these customers receive, we felt lucky to feature some of it on the shelves of the Produce Department. 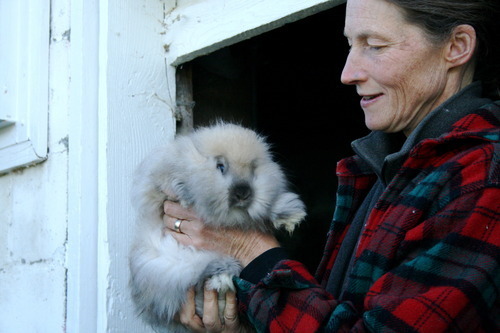 Also in the barn were Rachel’s dozen-plus English Angora rabbits, which she raises for their wool. Clearly, she has a soft spot for these fuzzies, and so do the kids who participate in Full Moon’s Farm Camp, which I would gladly relive childhood to attend. Before we had even seen the fields, I was regarding Dave and Rachel as ambitious, tireless people whose ideals were never far from sight. They are embracing the full circle that connects people and food, and doing it all with a big dose of honesty. The realities of farming are no picnic, and they still manage to inspire others to take on both the joys and the challenges of it all. What a team! We strolled past the Children’s garden accompanied by Clementine the barn cat to their greenhouses, where the pearly red onion harvest was curing. Rachel led us through rainbow chard and rainbow carrots, destined for winter CSAs, to a spectrum of winter squashes, a forest of brussel sprouts and kale, and a picture-perfect field of corn, which we are currently selling at HL. The shadows were growing long as we returned to the barn, where Rachel bid us farewell. It was at Full Moon that I felt most humbled and awed by the full spectrum of farm life, and gratitude welled up in me for good people like Dave and Rachel who aspire to do what needs doing and do it well. There’s no one I’d rather have as my farmer, and I hope you feel the same way! This entry was tagged breadandbutterfarm, burntrockfarm, farmtrip, fullmoonfarm, harvestseason, healthyliving, jerichosettlersfarm, organic, perks. Bookmark the permalink.